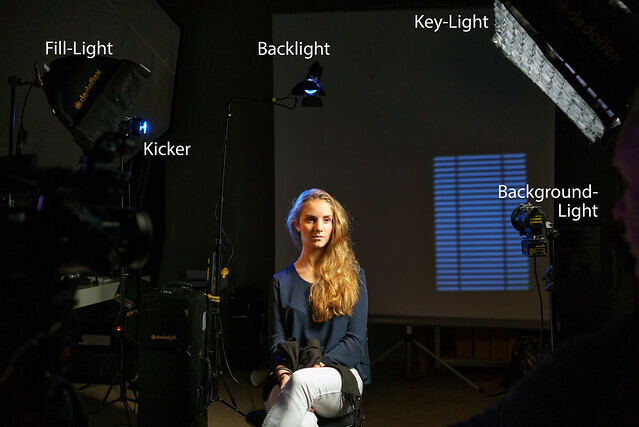 Dedo Weigert, a passionate cinematographer and inventor of the Dedolight system demonstrated some examples of easy installable light setups in a light workshop in Hamburg. Before going into practice, Dedo explained very useful background information about current lighting technologies, their advantages and drawbacks. As I avoided using LED light until today due to its problematic light spectrum with a high peak at blue and a deep dent beside that peak as well as a weak reproduction of red (see a typical chart here), I could see for myself that the development of white LEDs made huge progress. Latest generations of white and amber LEDs are able to produce a spectrum with a CRI (colour rendering index) between 92 and 97 (sunlight has a reference value of 100, halogen light has a CRI of 98). The key light in a large softbox is set in an angle that gives the face a three dimensional impression. The light source produces a reflection in both eyes giving the talent more liveliness and a light triangle between the nose's shadow and the fall-off to the cheek. A louvre is added to the softbox in order to avoid stray light falling on the background. The fill light brightens up the shady side a bit to make the scene look less dramatic. The advantage of LED light is here, that you can dim it without changing its light temperature. The back light (formed to a narrow light cone) seperates the person from the background and gives a more threedimensional impression as well. 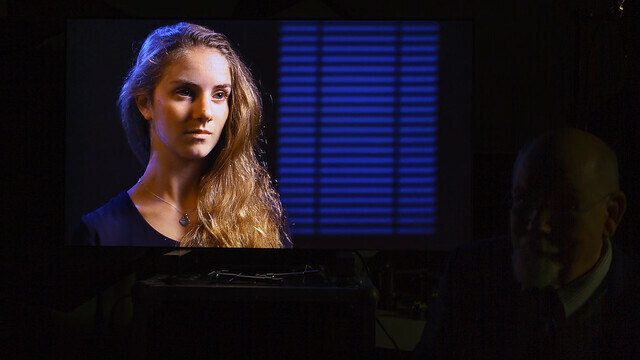 Quite often the backlight is chosen with a cooler light temperature fitting to the background. The "Kicker", formed to a narow band, adds some additional plasticity to the areas not captured by the back light. A background light allows additional control over the arrangement of the background. If it is projected with a blurry contour, it gives the scenery more depth even if you capture it using a camera with a small sensor. The following image shows the result from the camera reproduced on a control monitor (beside that you see a contour of Dedo Weigert explaining the setup). If you are interested in more information on Dedolight products, you should take a look at http://dedoweigertfilm.de. You can order their products for example from Videodata, who provided that workshop.